What were the "railroad glory days?" Well, for me the real glory days were the late nineteenth century when railroading was still the biggest and most dynamic industry ever know to man. But practically, for my purposes in this little web magazine, they are more recent: the last vestiges of the old ways things were done -- things I was around to witness and to photograph: the late days of steam, passenger trains, interurbans, train orders, telegraph, and real narrow gauge railroading. I'll include a few visits to abandoned lines and restored or still operating "heritage railways." Sometimes I may drift away even from these guidelines, but it is my site, isn't it? 491 was taken out of service earlier than most of the class because its throttle leaked. It was acquired by History Colorado in 1970 and was moved to the Colorado Railroad Museum in 1985. Ownership was transferred to the museum in 2013, and in August 2014 the locomotive was back in steam -- a big accomplishment by the museum's staff and volunteers. I grew up in the little, yellow brick, bungalow styled house at 31 South Illinois Avenue in Villa Park. The little house is still there, but much has changed in the neighborhood since then. When I was a boy, there were but two houses on the east side of our block and five across the street. But my parents remembered when Villa Park was really young. When I was born, my mother's doctor was Geno Ethel Beery; therefore, I was one of her babies too. For the first few years of my life, my mother took me to her for regular visits. "Docky," as she was always known, was quite a character. She practiced medicine at a time when few women did, and she was proud to have been the first woman to graduate from her medical school. It apparently took a formidible woman to tolerate the all male environment of her school at the time, but Docky definately fit the requirements. I think most people become railfans because their father or some other close relative or friend is a fan or works in the railroad business. But my father was not a railfan, and I didn't know anyone who was or who worked in the business either. In fact, both my parents matured with early automobiles and early amateur photography too. My parents were witnesses to the growth of the automobile age. Both my grandfathers were early car owners, and both families were lucky enough to have a photographer to chronicle some of their early examples: Father�s Uncle Mesheck and Mother�s Uncle Arthur took photographs before such a practice was common. I am left photographs of early family automotive history and also with memories passed down to me. Learning the intricacies and the superiority of a railroad watch. My grandfather taught me that if one wanted a good timekeeper, a railroad watch was the answer. It was also from him that I learned the mysteries of lever setting a watch. Standard time, accurate time, reliable time and American clocks and watches. The development of accurate time keeping standards and devices was absolutely necessary to the unprecedented growth of the railway industry as it developed in North America. My parent's house in Chicago's west suburban Villa Park had, when I was a boy, a very fine view of the Chicago Great Western tracks. From the paired dinning room windows, I could see across four vacant lots and a street, Great Western Boulevard, to the right-of-way where long freight trains ran. All during World War II there were trains loaded with army goods: I remember seeing big guns, tanks, half-tracks and jeeps. A first class electric railway which was always there -- until one day, it wasn't. For a little boy growing up in Chicago's western suburb of Villa Park just after the war, the old 'Ror'n' Elgin was the main feature of any visit to either of Villa Park's two downtown districts. Crossing bells were always ringing as the gates went up and down all day long. Local trains stopped only briefly; express trains regularly raced through town at speeds in excess of sixty miles an hour, air whistles screaming. I first heard news of a big train wreck in Philo on Wednesday, October 3, 1962. Kennedy was in his second year as president; the Cuban Missile Crisis was only 15 days in the future; I was attending the University of Illinois in Champaign/Urbana. That morning my clock-radio came on at the usual hour with a local news broadcast. Through the fog of sleep it slowly registered that there had been a train wreck in Philo the previous evening. No trains were running on the busy Wabash main line. Philo is only about ten miles southeast of the University. I quickly put on a white shirt, tie, sport coat and fedora, grabbed my father's camera, which I happened to have at school, and headed out the door. The second Insull interurban was about to expire. My first train ride was on the blue and gray electric cars of the old Chicago Aurora & Elgin. When the end was obvious for the CA&E, I wanted to ride the lines west to Aurora and Elgin. Somehow I never got around to it; I have been kicking myself ever since. But the CA&E was only one of three once related interurban electric railways. In the teens and twenties, Samuel Insull acquired control of all three of Chicago's big interurbans. The other two were the Chicago North Shore & Milwaukee and the Chicago South Shore & South Bend. Not one but two big steamers. The flyer I received in the mail was simply too much to ignore. Sunday, September 6, 1959, the Chicago, Burlington & Quincy would operate a steam excursion using not one, but two big steam locomotives, and one of them was to be a 2-10-4, Texas type. By late 1959, these wonderful machines were becoming increasingly hard to find. I simply couldn't resist. At the end of the glory days of mainline steam, the last opportunities near me, were provided by the steam program of the Chicago, Burlington & Quincy. Following My First Fan-trip behind Burlington's double headed special I was determined to see what else the CB&Q had to offer. There were four railroads that helped shape my juvenile mind in the direction of becoming a hopeless, life-long railway enthusiast. Three of these railroads (The Chicago Great Western, The Chicago Aurora & Elgin and the Chicago & North Western) passed through my boyhood home town of Villa Park, Illinois; the Illinois Central nearly did so. The IC actually passed a little north of town. There was no station for Villa Park, and in fact I don't even remember even seeing a train on that portion of the IC more than once, but influence my young mind it certainly did. Photographic adventures of a young railfan. When I was a young boy, and of course typically not very interested in such things, my father mention to me one evening that there was a place in Illinois named for our family. He knew our branch of the Brewer family had pioneered near Danville at a very early date. Father went on to tell me that this place was located somewhere near Danville along the Chicago & Eastern Illinois Railroad. He didn't think it was actually a town. Reader Railroad was all steam 'til the end in 1974. The railroad's listing in The Official Guide of the Railways proudly proclaimed, "The last remaining regularly scheduled mixed train drawn exclusively by steam locomotives." Perhaps to emphasize, under "equipment," the listing elaborated, "Note: steam power is guaranteed on all trains." Scenes from the Piney Woods of East Texas. In my youth, I was already a steam fan, but by the time I had means to explore and photograph, steam was about just about finished in the United States. My first solo trip far from home was to a new job in Houston after I finished my education. Where could still I find steam along the way? When I was a boy, not long after World War II, my father was sent, several times, from Chicago to New York City on business. The first time, he traveled on the Twentieth Century Limited, at that time still one of the very best passenger trains in America. On all subsequent journeys, he traveled via American Airlines, first on DC3s, later on DC7s. As a budding young railway enthusiast, I was astonished. Why would anyone not choose to travel on one of the world's most renowned trains? His reply was that while the railway personnel were all old, surly, and officious, the airline people were all young, energetic and eager to please. I suspect that the glamorous, young and pretty stewardesses may have been a factor left unmentioned. I first encountered the Denver & Rio Grande Western's remaining narrow gauge lines in 1956. I was already a steam enthusiast, and the D&RGW's narrow gauge was still steam. Somehow, by begging, pleading or nagging, I had talked my parents into stopping in Alamosa on a family vacation to Colorado. We stayed at Bob Richardson's Narrow Gauge Motel and museum. While talking to Bob, he drew us outside to witness the early evening passage of a real, steam powered, narrow gauge, freight train headed west with two engines and a full trainload of large pipes destined for the oil and gas fields near Farmington, New Mexico. Two days later, our family rode the D&RGW's Silverton Train behind Engine 476. It was all steam, narrow gauge, with vintage wooden cars and gorgeous Colorado scenery: I never got over it. One year later I was back. Now on my way east, I detoured once again to Durango on my way from LA to a new job in Dallas. Not much had changed since 1965, but a great deal has changed since. On this trip, I was not fortunate in finding freight activity. Otherwise, the visit was much like the previous year done in reverse. Once again, I toured the yard in Durango, rode the train to Silverton, and hurried on my way via Chama. But I added a detour to Monero along the way just to check the place out. Once common snow fighting machines were seldom seen operating. What sight in railroading could be more exciting than a rotary special? One or more steam locomotives heading out with a rotary plow, all under steam, to defend against Mother Nature's latest work to thwart the ongoing struggle in maintaining the flow of interstate commerce? Cold damp air always emphasizes the drama of steam in action. Clouds of steam and coal smoke, the arch of the snow discharge and frequent whistle blasts echoing in mountain canyons add to this effect. Exciting, to be sure, but frequently seen, no. Even photographs of such occasions are rare, because those who don't have to brave a major blizzard or its after effects were usually still snug in their beds. The Cumbres & Toltec Scenic Railroad was fortunate to inherit not just one, but two of the D&RGW's four narrow gauge steam rotary snow plows. Two years after the OM'76 event, the C&TS offered another snow fighting demonstration. This time OY would be the star attraction with additional snow fighting demonstrations using Jordan Spreader OU. Not quite one man's collection. Donald Tallman is the sixth Executive Director in the history of the Colorado Railroad Museum. The founder, Robert W. Richardson, was also the first director. I first met Bob Richardson in Alamosa, Colorado at the Narrow Gauge Motel and Museum. The year was 1956, and somehow, by begging, pleading or nagging, I had talked my parents into stopping there on a family vacation to Colorado. While talking to Bob, he drew us outside to witness the early evening passage of a real, steam powered, narrow gauge, freight train headed west with two engines and a full trainload of pipes destined for the oil and gas fields near Farmington, New Mexico. Two days later, our family rode the Denver & Rio Grande Western's Silverton Train behind Engine 476. It was all steam, narrow gauge, with vintage wooden cars and gorgeous Colorado scenery: I never got over it. Is this any way to run a railroad museum? A non-railfan's plans for revitalizing the Colorado Railroad Museum. I always assumed that the executive director of one of the nation's major railroad museums would be a railfan. Certainly, Bob Richardson, the founder and the long time director of the Colorado Railroad Museum, was the consummate fan. But things have changed at the CRRM. Donald Tallman told the board, "If you are looking for a railfan, I'm not the guy, but if you are looking for someone who can run a business, I can do that." He started as executive director in October 2006. It was a little over five years ago that Donald Tallman took over as Executive Director of the Colorado Railroad Museum. I first had an opportunity to talk to him about his plans about four years ago when he had been on the job for a little over one year. Now, for a second time, I had the opportunity to sit down and talk with, the now seasoned, Director about how his management has worked out and what he sees as the museum's future. One glorious year on the Georgetown Loop. Georgetown, Colorado - For the first time in many years, the canyons west of here echo to the sounds of a genuine Colorado & Southern steam engine. C&S Number 9, a diminutive mogul built by Cooke in 1884, was primarily used in passenger service. It hauled the last passenger train from Leadville to Denver on April 10, 1937. The locomotive was saved to participate in the World's Fair of 1939 and later operated at the Chicago Railroad Fair in 1948-1949. It then went to the Black Hills Central in South Dakota where it languished until being purchased by the Colorado Historical Society in 1988. Uhrich Locomotive of Strasburg, Colorado restored the engine in time for the 2006 operating season. Arthur M. Wellington seemed to think so. UP chief engineer, Jacob Blickensderfer, faced with a tough job when he was assigned to extend the narrow gauge Colorado Central from Georgetown to Silver Plume. While the two towns are only about two miles apart, Silver Plume is 638 feet higher up in the Colorado mountains. (The extension was done under a subsidiary name, The Georgetown, Breckenridge and Leadville Railroad). In North America, the first narrow gauge railways that normally come to mind are the Denver & Rio Grande in Colorado and New Mexico, the East Broad Top in Pennsylvania and the White Pass & Yukon in Alaska and Canada. No doubt, this is because they were the longest lasting and, in the case of the D&RGW, the biggest of them all. For this little railway, the gold rush is back. Skagway, Alaska -The White Pass & Yukon Route was built to take miners and supplies to the newly discovered Klondike gold fields. That was over a century ago, but now the gold rush of Alaska cruise ships is bringing far more business to this narrow gauge railroad than the original gold rush ever did. Britain is not only the birthplace of the steam railway but also of narrow gauge steam railways. For this narrow gauge enthusiast, a trip to Wales was a visit to the origins of it all. That might not be enough, but for the fact that the UK is also the birthplace of railway preservation. The British clearly have a passion for their past -- including steam railways. The website, The Great Little Trains of Wales, lists ten preserved narrow gauge railways, all but one in the north of Wales. The newest and the longest of these is the Welsh Highland Railway, mostly operated using unique Garatt type locomotive. The recently completed line only opened for through trains a few months before my visit. Said to be the world's first "preserved railway." The Talyllyn is a little railway with lots of claims to fame. It was the first narrow gauge railway in Britain authorized by an Act of Parliament to carry passengers using steam. It is said to be the first "preserved railway" in the world. It was the inspiration for the classic British film, "The Titfield Thunderbolt." Reverend Wilbert Vere Awdry (1911 - 1997) was also inspired by the Talyllyn for his extremely popular "Railway Series" of children's books staring the familiar blue, Thomas the Tank Engine. In 1952, Awdry volunteered as a guard (that's British for conductor) on the Talyllyn where he was also an early member. In pastoral Northern Wales, not far from the English border, is the little village of Llanfair Caereinion, present day home to the Welshpool & Llanfair Light Railway. This is rural country, not mountainous like farther west. The gently rolling landscape is dotted with small farms and pasture land. It was in fact agriculture that brought the railway here. Unlike all the other Welsh narrow gauges I visited, the W&L was built not for mining, but to haul agricultural goods and perhaps a few rural citizens to and from the small market town of Welshpool or to the standard gauge connection there with the Cambrian Railways. Things seem peaceful enough in the canyon now. Canon City, Colorado -- All is quiet and peaceful as the little train clicks and clacks along the bank of the Arkansas River and gradually enters the great, dark canyon. It is a fine Rocky Mountain spring day and still not yet very green, but cholla cactus bloom bright yellow along the tracks. A hawk soars far overhead, while, below, the river flows heavily with spring runoff. No highway invades this gorge. The only people we see along the line are riding rafts or kayaks down the Arkansas River or enjoying a bit of fly fishing after a long hike. But it wasn't always this quiet and peaceful: this is the site of, "The Royal Gorge War". Major historical events with far reaching significance to Colorado and the nation's transportation system happened here in the 1870s. Colorado is very fortunate to have more historic, steam operated railways than most other states and more active locomotives too. We have the Durango & Silverton Narrow Gauge, the Cumbres & Toltec Scenic Railroad, the Georgetown Loop as well as occasional operations at the Colorado Railroad Museum and a visit or two yearly from one of the two big Union Pacific engines based in Cheyenne, Wyoming. Add to all that a new steam passenger railroad: the Rio Grande Scenic Railroad based in Alamosa. We watched former Denver & Rio Grande Western Caboose 0540 slowly disappeared among the tall ponderosa pines. When the train was gone, the only sound we could hear was the friendly rush of the nearby Animas River. Then it struck us how alone we were in this sometimes all too crowded world. For five days and four nights, my wife, our son and I would call home a converted, narrow gauge boxcar parked here at the tail of Cascade Wye. Seattle's late, lamented dinner train. Kirkland, Washington - The Spirit of Washington Dinner Train passes through here twice daily - four times on weekends. Even when I can't see it, I can hear it. But not for much longer: Scheduled highway construction on I-405 will force the end of service on the former Northern Pacific line - home to the dinner train for the last fifteen years. The right-of-way will be sold to the county and will most likely become yet another hike and bike trail on former railway property. Apparently recreation wins here over serious thoughts of transit improvement to the woefully clogged Eastside traffic arteries. The last dinner train is expected to run July 31, 2007. BC Rail's Royal Hudson and friends. "If God had intended for us to fly, He never would have created the steam engine." That is how Les Wilson, Guest Services Representative aboard the Caraboo Prospector, expressed his travel philosophy. Les regularly rides trains of the British Columbia Railroad where, he points out scenic spots and tells the passengers about the railway and the countryside. Previously he worked aboard a real steam ship. In the railway world, there are legendary places: some are sites of great events; many are sites of great engineering accomplishments, incredible scenery or both. In some of these places, the rails still serve, but many have not seen a train in years. Colorado has more than its share of legendary places. One of them is Corkscrew Gulch turntable on the long ago abandoned Silverton Railroad. In a race with the Denver & Rio Grande, the Denver, South Park & Pacific built westward to what was anticipated to be a lucrative mineral market in Colorado's Gunnison region and perhaps beyond. Both crossings of the continental divide were difficult. The D&RG bought and build on Otto Mears' Marshall Pass toll road reaching an elevation of 10,842 ft (3,305 m); the DSP&P tunneled beneath the divide at Altman Pass (later known as Alpine Pass). The 1,772 foot long (540 m) Alpine Tunnel attained an elevation of 11,523 feet (3,512 m) at its apex. Some of my favorite Denver buildings. I know nothing of architecture, but that doesn't keep me from knowing what I like: I like Victorian. The late nineteenth century was a time when aesthetics really mattered - not just in building design but in art, music, and even industrial designs. People of the era felt a compulsion to make every building, every surface and every object visually interesting. This rule generally applied not only for fine mansions, but for lesser houses and for factory buildings and public places. Architects of the day were concerned as much with the appearance of a building as they were with its functionality. A house or a commercial building was regarded as "a gift to the street." 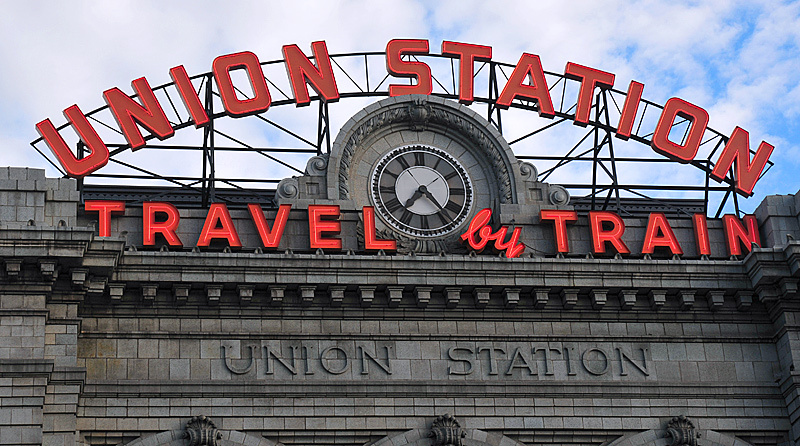 Denver's Union Station has been modified considerably over the years � each version becoming more and more eclectic. Another rebuilding has been completed in 2014. The following is my (apparently minority) opinion. In the Nineteenth Century, San Francisco's grandest mansions were built on top of what is now known as Nob Hill. But they were all doomed; no one anticipated the disastrous earthquake and fire that struck the city early in the morning of April 18, 1906. The "Grammar of Ornament:" what an intriguing title. The book by Owen Jones, a Welsh architect, was first published in 1856, and he really meant it: the book lists 37 "propositions" for ornamentation or decoration. All content Copyright � 2014 Glen Brewer unless otherwise noted.